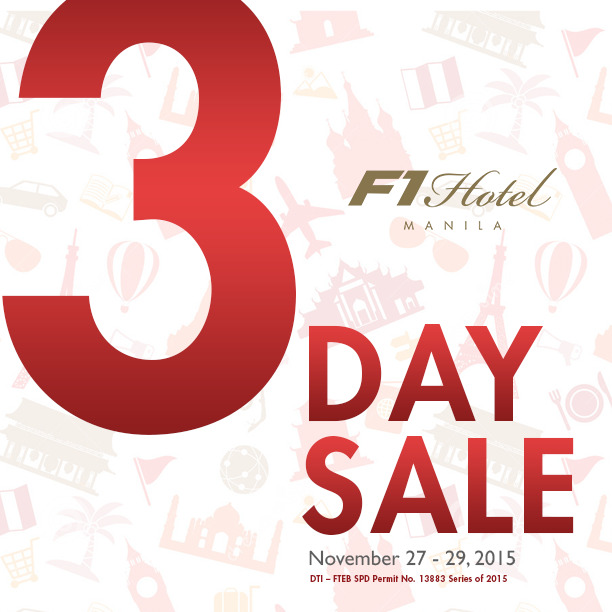 Avail of these special deals with F1 Hotel's 3-day Sale! 1. Purchase gift certificate by going to F1 Hotel Manila’s The Great F1 Sale from November 27 - 29, 2015 from 10AM to 5PM at the reception area of F All Day Dining Restaurant, 3rd floor or F1 Hotel Manila. 2. Redemption period is from November 27, 2015 to May 27, 2015. 3. All payments shall be settled thru cash or credit card. 4. Stolen or lost gift certificates will not be replaced. 5. All gift certificates are transferable but are not convertible to cash. 6. Gift certificates cannot be combined with other hotel promotions, benefits and/or privileges such as the Senior Citizen discount or PWD discount.